The Foreign Ministry of Iran threatened to pursue legal action against Google Thursday over an issue it has regarding Google Maps. The Persian Gulf isn't labeled. CNN reports that Foreign Ministry spokesman Ramin Mehmanparast raised the labeling issue on Iran's state television network today, calling it "a shameless act…against historical documents," and criticizing Google for toying with Iranians' sympathies. "Omitting the name Persian Gulf is (like) playing with the feelings and realities of the Iranian nation." 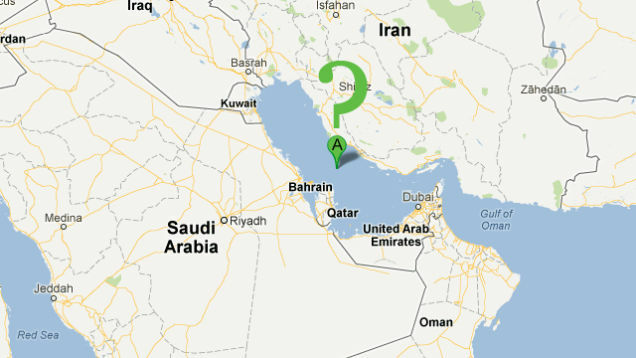 He added that state officials intend to file an official complaint against Google, warning that the company could incur "serious damages" if it does not label the blue area in question "Persian Gulf." While Iran claims Google used the name for a time, then removed it, an anonymous Google source told CNN the body of water was never labeled because not all the bodies of water have labels, gosh. "It's just simply the case that we don't have a label for every body of water." However, nearby bodies of water, such as the Gulf of Oman and the Red Sea do have names that appear on the map. Also labeled: New Hampshire's famous "Jew Pond," or, as it is known to some, "The new man in town". The name of the waterway (the gulf, not Jew Pond) has long been a source of tension between Iran and its Arab neighbors, who refer to it as "The Arabian Gulf." CNN reports that some pro-Persian groups on Facebook are even calling for a boycott of Google over the issue, which is great news for Bing. For the record, entering "Persian Gulf" into the Google Maps search bar does take you to the body of water in question, but it appears as a nameless splotch of blue.